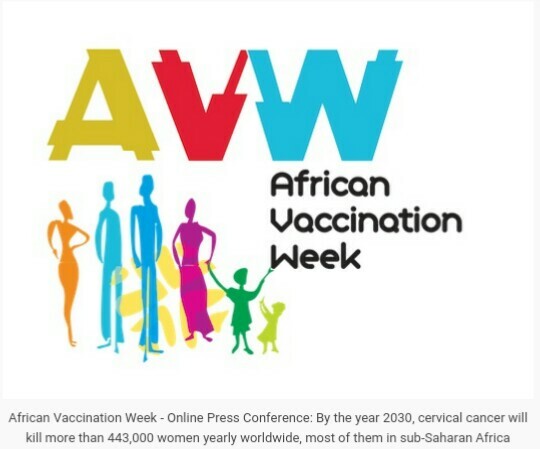 The 8th African Vaccination Week is set to be celebrated from 23 to 29 April this year online following experts review that by 2030, cervical cancer will kill more than 443,000 women yearly worldwide, most of them in sub-Saharan Africa. Cervical cancer remains a leading cause of cancer death among women in Africa. According to the Expert Review of Anti-infective Therapy, by the year 2030, cervical cancer will kill more than 443,000 women yearly worldwide, most of them in sub-Saharan Africa. According to the Human papillomavirus (HPV) Center, 2017, cervical cancer ranks as the most frequent cancer in women in Malawi, Kenya, Zambia and Zimbabwe and the second most frequent cancer in women in South Africa. In a media release the organisation issued recently, it states that the increase in the incidence of cervical cancer in Africa could counteract the progress made by African women in reducing maternal mortality and longevity. Nevertheless, cervical cancer is a potentially preventable non-communicable disease, and intervention strategies to eliminate cervical cancer as a public health concern should be urgently implemented. Head of the Gynaecological Oncology Unit at the University of Pretoria, Greta Dreyer, and Pathologist (Medical Virology) at Lancet Laboratories (South Africa), Dr. Karin Richter, will host an online press conference on 26th, April 2018 at 11am South Africa Time. Journalists interested in participating in this online press conference are invited to register in order to be able to ASK QUESTIONS LIVE VIA THE INTERNET. The conference will have both the English and the French languages simultaneously.